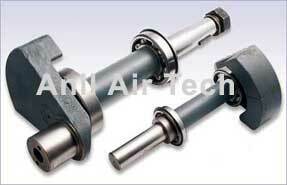 Crank shafts are available for both the type of compressor that is Air cooled & Water cooled unit. 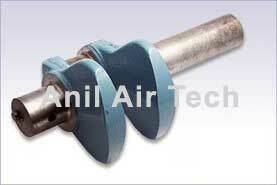 Crank shaft for Air cooled compressors rotates on heavy duty ball Bearings which are hydraulic pressed with axial alignment. 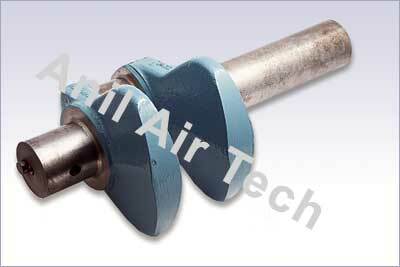 These Crank shaft are dynamic balanced for vibration free working of unit & properly drilled for mounting of centrifugal unloaders to release pressurised Air / Gas from Intercoolers during unload position. Forged heavy duty Crank shafts are for water cooled heavy duty compressors. These crank shaft are machined and ground on Main Bearing Journal & crank pin Journal by maintaining diametral tolerance and axial tolerance perfectly with main Bearing bushing & crank pin bushing. 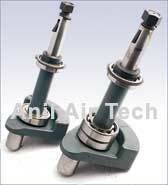 Also Internally perfectly drilled for oil path for proper lubrication & to maintain oil pressure.